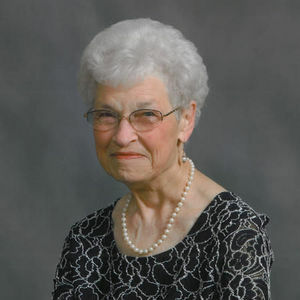 We celebrate the life of Marlys J. Hauschild, 82, Breckenridge, MN, who was received into Heaven on Monday, October 14, 2013 at her son's home, surrounded by her family and under the care of Riveredge Hospice. The Funeral Service will be 10:00 a.m., Friday, October 18, at Immanuel Lutheran Church, Wahpeton, with Rev. Morris Stephens officiating. Visitation will be Thursday, from 5 PM to 8 PM, with a 7 PM Prayer Service at Willow Creek Chapel, Wahpeton, and one hour before the service at the church on Friday. Interment will be at St. John's Lutheran Cemetery, Tyler, ND. Vertin-Munson FH, Wahpeton, have been entrusted with the arrangements. Marlys was born April 12, 1931 near Tyler, ND, the daughter of Courtland and Laura (Meyer) Miller. She was baptized on May 10, 1931 and confirmed on May 20, 1945 at St. John's Lutheran Church, Tyler. She grew up on the family farm and attended Summit No. 4, graduating from Wahpeton High School in 1949. She was united in marriage to Floyd W. Hauschild on July 2, 1950 at St. John's Lutheran Church, Tyler, ND. They resided on the Hauschild home farm. Marlys worked in Food Service at NDSSS from March of 1969 to 1973 taking time off and going back to work from 1981 to 1997. In 1982, the couple moved into Wahpeton, Floyd passed away November 6, 2006. Marlys moved to Breckenridge in 2007, where she has since lived. Marlys was a member of St. John's Lutheran Church, Tyler, ND and currently belonged to Immanuel Lutheran Church, Wahpeton. She was active in both LWML's. She was a sexton for St. John's Lutheran Cemetery, was involved with Summit Township 4-H for several years and belonged to Immanuel Crafty Ladies. She enjoyed crocheting, quilting, baking and having coffee with her Summit friends each Wednesday. Marlys was a very unselfish person who had a great love and affection for her family and friends. Marlys is survived by six sons: Brian (Annette) Hauschild, Gillette, WY; Greg (Barbara) Hauschild, Moorhead, MN; Kevin Hauschild, Menahga, MN; Brad Hauschild, Fargo, ND; Kim (Heidi) Hauschild, St. Louis Park, MN, Noel (Val) Hauschild, Breckenridge; grandchildren: Brianne (Luke) Pennington, Seth and McKenna Hauschild, Heide (Travis) Martin, Mike (Jenn) Hauschild, Courtney (Ethan) Ehlert, Jessica (Barry) Stall, Jef (Whitney) Hauschild, Grant (fiancée, Grace Torguson) Hauschild, Cameron Hauschild, Nick (Stephanie) Hauschild, Dylan (fiancée, Julie Faure) Hauschild, Taylor Hauschild; step grandchildren: Neil (Amy) Powers, Nicholas (Heather) Powers, Vincent Twinn; great-grandchildren: Jude and Rafe Pennington Reilly and Sierra Martin, Kaitlyn, Haylee, and Grace Hauschild, Audrina and Willow Ehlert, Dexter Hauschild, Peter and Andrew Hauschild; step-great grandchildren: Meagan, Jaden, and Hunter Powers, Elizabeth Powers; her brother, Larry (Jeanette) Miller, Wahpeton; two sisters-in-law: Madeline Miller and Sophie Hauschild; and many nieces and nephews She was preceded in death by her parents, her husband Floyd Hauschild, her brother, Darrel Miller, her grandson, Tate Robert Hauschild, her daughter-in-law, Judy Hauschild, her niece, Gayle Miller and her nephew, Blake Miller. In lieu of flowers, the family requests a donation to Riveredge Hospice as a memorial to Marlys. The beautiful and interactive Eternal Tribute tells Marlys' life story the way it deserves to be told in words, pictures and video. Aunt Marlys was a gracious and wonderful lady. We will all miss her. God be with you her family and friends. Now she and Uncle Floyd are a beautiful couple again as I remember them as a child back in the Dakotas. My thoughts and prayers are with the Hauschild family during this time of loss of Marlys. She was a wonderful lady. I will never forget how sweet, kind and always had a smile on her face at church functions. When I would come back to Wahpeton to visit, I could always count on a hug from Marlys. Cherish all the memories you have. She will always be your angel in heaven with Floyd. Sorry to hear about your loss. I had the privilege on knowing your mom, what a quite, but sweet lady she was. She will be missed dearly. But know that she is in no more pain and that her and Floyd are back together and waiting for all of us to be with them again. To Noel and Val, just know that I will be thinking about you and sending prayers and hugs to help you get through these ruff days. I know in my heart, that she was greatful for all you did for her.